For many, the school year 2016-2017 is about to come to a close, and teachers, along with students, are eager to start their summer vacation. The number one thing school is intended for is learning, and not just for students, but teachers and administrators alike. The Bournedale Elementary School’s educators in Massachusetts, USA, learned a lot this year from their students and wished to share their experience with other school administrators and faculty members. In particular, the school implemented the HappyOrNot service, introduced by HappyOrNot Authorized Reseller Know Their Perspective, to collect student feedback. Bournedale Elementary School implemented the HappyOrNot service in November 2016. 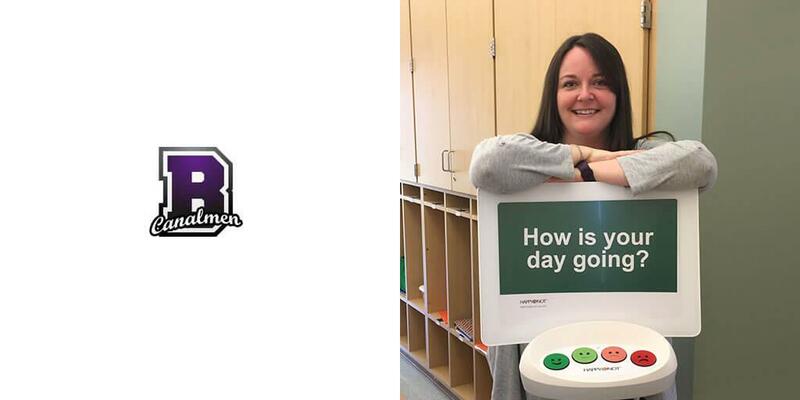 The school has a Smiley Terminal™ in several classrooms asking “How is your day going?”, allowing students to anonymously provide their feedback throughout the day with a press of a button. The Smiley buttons range from dark green (very happy) to dark red (very unhappy). Building rapport with students of all ages is always a priority for teachers. Often, teachers juggle the hats of educator, confidant, mentor, and role model. In recent years, students have also been faced with the challenge of juggling the roles of being a kid, an independent thinker, and, on occasion, a parent-figure. In a classroom of varying numbers of students, it can be challenging to identify and connect with students about their feelings throughout the day. Allowing students to have a voice of their own is always a want, and, more and more nowadays, a need. Teachers are constantly trying to identify the reasons behind successes and struggles, all in an effort to facilitate positive changes beneficial for their students. Through communication and feedback with students, we are able to make connections that support all their diverse needs. The well-being of students is also a constant priority of administrators and school-based parent/family groups. All parties share the same interest of making sure students have what they need to be successful. 1. How did you review and analyze the HappyOrNot results? As we are using HappyOrNot as a social-emotional aid in the classroom, we have been reviewing the data as a team of teachers, as well as with our students, to focus on the days and times that positive feedback is at its lowest. When reviewing with students, we also collect conversations regarding the impacts of HappyOrNot and the willingness of students to respond accurately. 2. Did you get useful insights out of the HappyOrNot results? Yes. For example, we have learned that students were not as happy on Wednesdays, and evidently happier and favoring days with special activities (art, physical education, music, etc.) or days before approaching a weekend or break. In teaching, feedback is one of the most important components in communicating with students about their successes. When conferencing and collaborating with members of the HappyOrNot team to find our successes with HappyOrNot, it has been extremely beneficial to be able to ask questions regarding the data results. They were able to identify key areas to focus on and provided insight on how to proceed in a way that worked best for our classrooms. 3. What kind of changes did you make based on those insights? The hourly and daily result data enables teachers to identify days and times where the index is lowest, then focus on those factors which may be impacting students’ social-emotional health during those target times. Teachers review the data together with students in an effort to gather their insight and ideas. Some of the factors affecting the student attitudes have been identified as home concerns, teacher-chosen working partners, and homework routines. 4. Did the changes make a positive impact? Since our changes have been implemented, we have seen a change in the students’ feedback. Furthermore, we have seen students become more willing to provide insight and participate in our weekly group discussions. Students’ enthusiasm towards homework and classwork have visibly become more seamless. They have been bringing forward more conversations around concerns and comments that are impacting their school day both positively and negatively. 5. How have the happiness scores progressed? At the launch of HappyOrNot, the school’s Happy Index was 53. This prompted teachers to immediately discuss the feedback with students on a weekly basis. After addressing the comments and concerns, the index improved to 67, and with continuous actions, in February 2017 the monthly results showed an index of 92. The school anticipates a continued rise as further improvements being made. 6. What do the parents think about HappyOrNot? We have been asking students to share the monthly data with their families, as well as their personal experiences with HappyOrNot. When meeting with parents during parent-teacher conferences, we found that many parents were interested in hearing more about our efforts towards improving their student’s social-emotional health. Families appear excited, especially for their child’s excitement with HappyOrNot. 7. How do you see the long-term benefits of the HappyOrNot service within your school? We have been collaborating with our administration to discuss outcomes and possible ways to bring HappyOrNot further than our individual classrooms, and out into the school community. We are planning on utilizing it during a school-based summer service program for our students. 8. What impact do you think HappyOrNot has made on your desired outcome of its use in conjunction with your personal goal for your teaching improvements? We feel that HappyOrNot has allowed our students to feel safe and secure when responding to our questions. It appears to have made an impact on their comfort level when discussing things that are impacting their school days. As a teacher, it has allowed me to connect with my students on a level that in the past has been inconsistently reached. Have a customer success story? Please share with us your customer engagement strategy. Get started here!